Holder of both race track license and lure coursing license. Eyes checked clear June 2009. Eyes checked clear June 2011. Hips A/A, elbows 0/0 July 2011. Scented AllMyLife, here at home called Ludde, was born in July 2007, in Sari Laakso's kennel. He came to us in October as a little bit over 3 months old. Luddes brothers and sisters were creme coloured like their father Thank You De Darjeeling (three boys and one girl) and silver brindle like their mother Khaos La Vida Loca (two boys and one girl). The other puppies had already left for their new homes when we came to pick up Ludde. Ludde is said to look very much like the father in type, and the other puppies do look like their mother. Ludde is a lovely Afghan to live with, and we are happy to have such a great dog personality to share our days with. He is extremely good natured, he is interested in everything happening around him, and his first reaction to something new is always a positive one. The vet is greeted with a swinging tail as well as every new person entering our home. He loves people. He�s doing very well with small dogs, and they all seem to like him too. As a puppy he was always hungry. He took every opportunity to investigate for more food, and he used his long legs to reach high! This was totally new to me, since my first Afghan did all in all steal one Parmesan cheese during his life and the second nothing. The appetite is more normal now, but he's still a master thief, with food as speciality. Looks like there is nothing compared to stolen food, and even stuff he otherwise wouldn't touch is delicious when stolen behind someone's back. Ludde made his show debut in 2008, and is a CAC winner. He has been a lovely show companion, taking the trips with ease. Judges are fun people according to Ludde, and are often greeted with a happily swinging tail. We have also taken him to the race track. He is interested in running, but he's not, at least not yet, taking it deadly serious. He has showed himself to be a real hunter by taking a crow at the age of five months, but that is not exactly the same as hunting down the fake rabbit on the track. We have to see how things develop as he mature! I'll try to find time to go to the track this autumn, in order to get an update on his interest in racing. I have, since the autumn 2008, taken part in agility training with Ludde, and it has been great fun! Ludde is pretty good for most of the time, I only wish I would learn as fast as he does! Ludde's favourite obstacle is the A-obstacle. Last autumn Ludde had some kind of teenage ideas, and did several times stop at the top of the A-obstacle, admiring the scenery, and refusing to come down when I called for him. Mountain Afghan indeed, but it was at times a bit frustrating:) In the spring of 2009 have things gone smoother, and these bursts of own track planning that he sported with last year have been fewer. Perhaps he's growing up in this field too! Update August 2010: During the summer of 2010 Ludde as well finished his FI CH title and found his inner hunter! 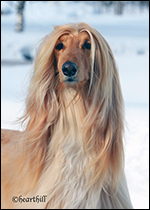 As we trained Micke with a piece of real hare fur something clicked in the brains of Ludde, and he realized what the meaning of life is for a pure Afghan hound, ie hunting rabbits! Ludde has trained on the race track during the summer almost weekly, and has now finished the first part of his racing license (the solo run). I would not last summer ever had believed he would do this. He very much remindes me of my first Afghan Husku, who would go bananas already from seeing his racing muzzle. Update October 2010: Ludde took part in his first lure coursing competition in september, placing 5th out of 16 Afghans, and was awarded CCQ! He also finished the test races, and got his racing license, and took part in his first racing competition on October 2nd, placing fourth out of five. Update September 2011: Ludde had a quite slow beginning of the year. He took part in a lure coursing competition and a track race competition, and had great fun. An minor injury to a toe put him out of competitions for May and part of June, and in July he had a hip and elbow X-ray taken (with excellent results, hips A/A and elbows 0/0) and was due to the anesthesics unable to compete for an other month (in Finland is general anesthesia regarded as doping and you have to wait for 30 days after it before the dog is allowed to compete again). After our move to Stockholm, Sweden, Ludde was entered to his first show in September, and finished his Swedish champion title at once. He was also Best Male 3 in Växjö in November. In September he took part in an international lure coursing competition and finished as sixth in very hard competition. Ludde is now in a very fit condition, and we do very much look forward to the racing and lure coursing year of 2012! Update February 2013: Due to a fall in a lure coursing competition i 2011 (muscular injuries undetected until now) and a second fall in the sand pit 2012 has Ludde been struggling with muscular problems all year long. He is now on the mend, and we hope he will be fit for competition in 2014! 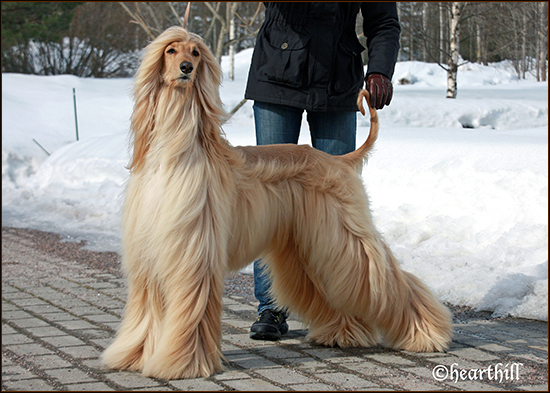 Ludde was second with prize of honour in the class for Afghans with clipped coat at the inofficial show of the Swedish Afghan hound Club.